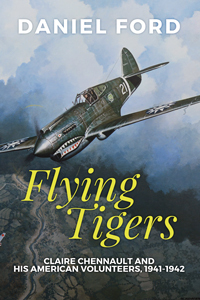 This is probably the iconic photograph of the American Volunteer Group Flying Tigers, taken by R.T. Smith of the 3rd Squadron Hell's Angels. His son, Brad Smith, describes the photo this way: "The photograph was taken by Dad, probably from #47, on May 28, 1942 near the Salween River Gorge. The shot includes #68 flown by Arvid Olson, #46 flown by Bob Prescott, #49 flown by Tom Hayward, #24 flown by Ken Jernstedt, and #74 flown by Link Laughlin. Dad remembered Bill Reed flying #74, but Ken Jernstedt, the only pilot associated with the shot still living, said Bill Reed was not in the area at the time." "It was a beautiful spring day, with a layer of strato-cumulus just above the mountain tops at about ten thousand feet off to our right. We were headed northeast near the Salween River which marked the China-Burma border, and although the air was relatively smooth I soon learned that taking a picture of this type was no easy task. It required trying to fly my plane on a steady course by holding the control stick between my knees, twisting back to my right while holding the camera with both hands, and waiting impatiently for the guys to stop the inevitable 'yo-yo'ing and get into proper echelon formation. There was the added requirement, most important of all, of scanning the surrounding sky every few seconds to make sure no Jap fighters were about to ambush us. The resulting exposure, as I recall, was made about f8 at a 200th of a second." 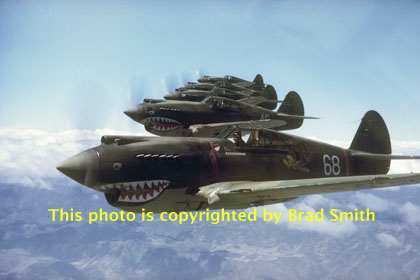 Just from my own experience, I can testify that when an artist was commissioned to illustrate an article about the AVG P-40s in Air&Space/Smithsonian, he showed the planes stacked up in much the same posture as R.T.'s Tomahawks. And when iUniverse did a cover for Remains, my novel about the Tigers, again the artist arranged the Tommis in that classic echelon formation. I'm sure there are many more examples of artwork influenced by this photograph, consciously or unconsciously. Brad has archival-quality prints made from his father's original 35-mm slide. Email him at brad_smith AT earthlink DOT net for information.